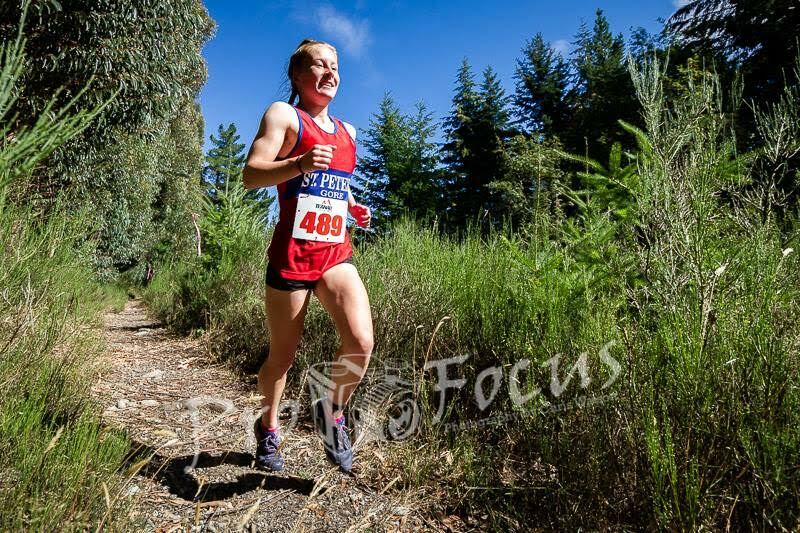 St Peter's Gore all-rounder Sophie Shallard running at the recent Te Anau Enduro event. She is currently training for the NZ Age-Group Swimming Championships in April. Southland’s Sophie Shallard has been putting her versatile array of sporting skills to good use lately on both land and water. The year 11 St Peter’s College, Gore, student recently won the U16 race at the Southland Secondary School Triathlon Championships and then two days later won the U16 Otago/Southland Water Skiing Championships, before returning to school to break three records in distance races at her school’s schools athletics championships. “Last year I came second in the same event, so it was really good to win this time,” says Sophie about her water skiing win. The water skiing is a slalom event, competing on one ski at speed in a zigzag course that has six buoys on each side to get around. The age-grade records she broke at her school’s athletics day were the 800m, 1500m and the 3000m. She also has a strong sporting background in figure skating and hockey. Sophie (right) at last year's swimming age-group nationals. Erika Fairweather (centre) was subsequently the youngest athlete at last year's Youth Olympic Games. ​But none of these sports above are her priority. Sophie is currently training for this year’s National Age-Group Championships in Wellington from 16-20 April. She has been swimming competitively since she was young, and she swims for Hokonui Aquatics and trains locally at the Gore Aquatic Centre for the most part with year 12 St Peter’s male swimmer Xander Marsh. “But I am also going down to Invercargill once a week to train with the Southland squad ahead of Nationals. Sophie (left) with Southland GHS's Jorja Clallahan after this year's Southland Triathlon Championships. She missed last weekend’s SISS race in Oamaru as she was competing in the Enduro running race in Te Anau. What about more triathlons – or duathlons - in the future? “Last year I realised that my swimming helped my fitness for my running. Sophie also has experience on the running track at a regional and national level. She subsequently made the semi-finals of the 800m and the final of the 1500m NZSS Championships in Dunedin in the Junior Girls but admits she was unfit and underachieved, finishing well outside her PBs in both races. Plus there is also the NZSS Secondary Schools Cross Country Championships in the middle of the year in Timaru, Sophie finishing midfield in the Junior Girls race in Taupo in 2018. With swimming and running coming together to form two thirds of triathlon, how does water skiing fit in, if at all? As well as sport, Sophie has also started NCEA Level 1 at St Peter’s so schoolwork needs to fit in there somewhere too. The Wellington College swim team with the NZSS Boys Trophy. Swim team co-captains Harrison Neal and Thomas Watkins. The NZSS Swimming Championships have been contested on an annual basis since 2011. Wellington College won the inaugural meet, which included one trophy awarded to the best overall boys, girls and co-ed school, and they won the next two boys meets after that when separate trophies were awarded to the leading boys, girls and co-ed schools. Westlake Boys’ High School (twice), Auckland Grammar School and Tauranga Boys’ College won the Boys Trophy between 2014-2017. 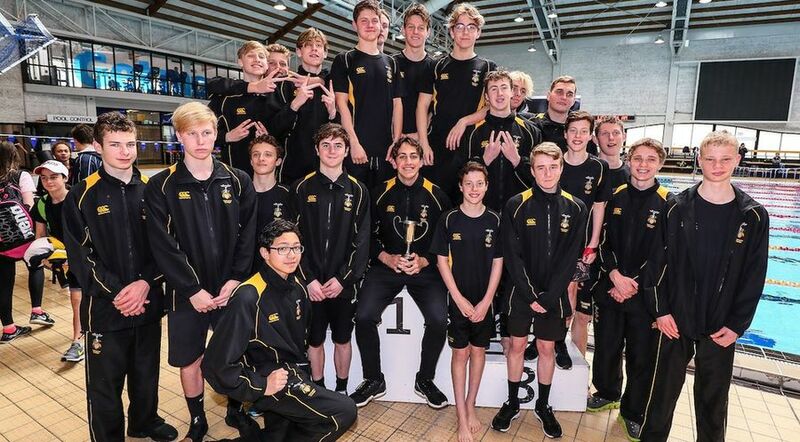 This year’s championships were held at the Wellington Aquatic Centre over six sessions from last Thursday to Sunday, and it was once again Wellington College that emerged victorious on the final day, reclaiming the title with a completely new team from the one that last won in 2013. The Wellington College team won 27 medals (eight gold, eight silver and 11 bronze), with 16 of 26 swimmers contributing points, across five age divisions, in a short-course (25m) format. Thomas Watkins leading the way. 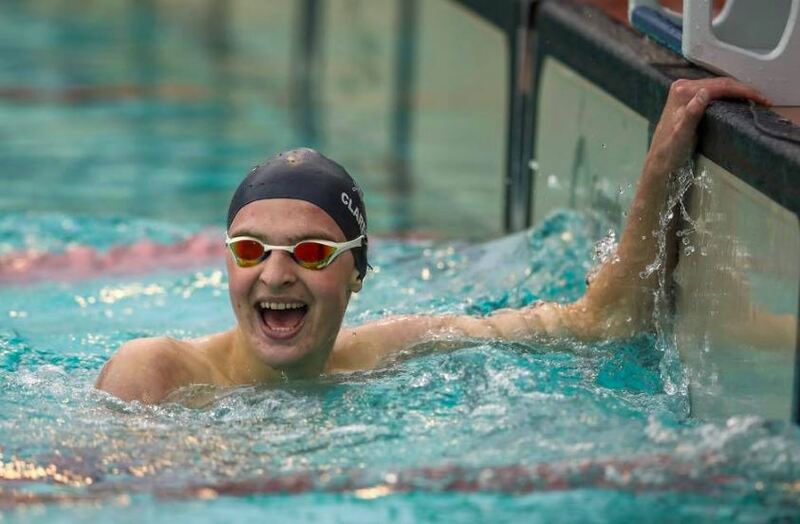 Team co-captain and year 13 swimmer Thomas Watkins won four golds on his own and led by example in and out of the water, but said it was a genuine team effort that was the key to victory. Points in each race were awarded for the first 10 places, on a sliding scale of 26, 21, 17, 14, 12, 10, 8, 6, 4 and 2 points per race. ​Wellington College won with 830 points, ahead of St Andrew’s College on 766 and Pakuranga College in third on 571. Eligh Ashby in action in the butterfly. Individually, Atakura Julian was also strong in the same grade as Watkins. Eligh Ashby did extremely well to successfully clean-sweep the butterfly events in the 15 year age group for his three gold medals. Both Dillon Raimona-Pahetongia and Jonas Lilley were similarly prominent. “Many of us are part of the same swim club [Capital] and we are all swimming together quite regularly, so it wasn’t too hard to get a good team bond going,” said Watkins. The senior swimmers with the Trophy, with outgoing swimming master Mr Vaughan. Wellington College’s team was also swimming for the school’s swimming master Martin Vaughan who is retiring from this role this year, having been in charge of the school’s swimming programme since 1983. “We all wanted to get up for Mr Vaughan who has done a great job for many years and we want to keep the swimming tradition going for the school that he has been a huge part of." Watkins said that there are a number of swimmers coming through so the future looks bright for the school. For many of the elite swimmers, the NZSS meet also served as preparation for the New Zealand Short Course Swim Championships at the Sir Owen G Glenn National Aquatic Centre from 2-6 October. At the end of August he competed at the Junior Pan Pacific Championships in Fiji, competing against the best U19 swimmers from countries such as the USA, Australia, Japan, China and Canada. Meanwhile, Auckland’s Diocesan School For Girls won the Girls Trophy at the NZSS meet, finishing on 1115 points and head of second placed Waikato Diocesan School on 1004.5 points, with a big gap to third-placed Wellington school Samuel Marsden Collegiate on 466.5 points. St Andrew’s College won the Co-ed Trophy, ahead of Pakuranga and Kapiti Colleges. Some 64 boys, 62 girls and 10 co-ed teams took part. 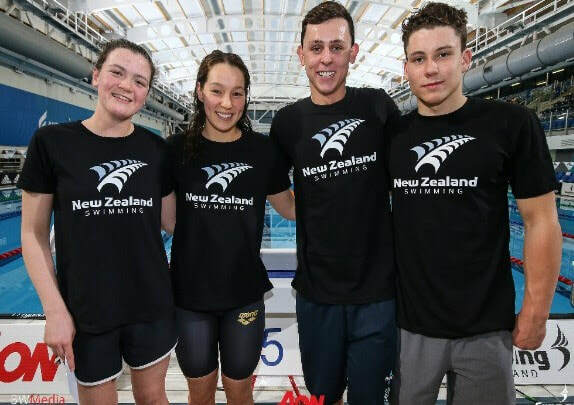 Two Current New Zealand secondary school swimmers will be competing in the pool at the upcoming Youth Olympic Games in Argentina. Gina Galloway from Diocesan School for Girls, Auckland and Erika Fairweather from Kavanagh College in Dunedin are the two swimmers selected. They are part of a four-strong team that also includes Zac Reid who is in his first year studying at Massey University and Michael Pickett who now attends school in Brisbane. Galloway (aged 17) is the granddaughter of Ngaire Galloway, who at 93 years old, is New Zealand’s oldest living Olympian, and like Galloway senior competes in the backstroke. Galloway junior won a bronze medal at the 2017 Youth Commonwealth Games and will compete in the women’s 50m, 100m, 200m backstroke and 100m butterfly events. 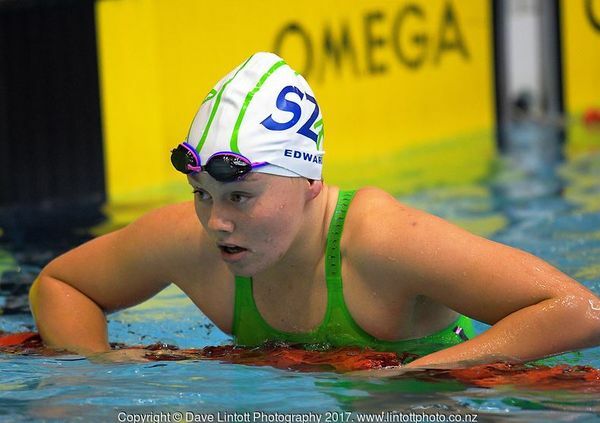 Otago’s Erika Fairweather (aged 14, Kavanagh College) will likely be one of the youngest athletes, if not the youngest athlete, competing at the Buenos Aires 2018 Youth Olympic Games as her birthday (31/12/2003) is the cut-off date for eligible athletes. Fairweather who now holds 12 national age-group records, including the girls 14 years 200m and 400m freestyle short course records set last weekend at the Otago Winter Championships. Macy Burns (left) being tagged by Junior Black Fins captain Claudia Kelly at the Sanyo Cup in Japan June with the New Zealand Surf Lifesaving High-Performance team. PHOTO: Lester Kelly. She only took up her sport last season, but this November Wellington East Girls’ College’s Macy Burns joins the Junior Black Fins team for the 2018 Lifesaving World Youth Championships in Australia. Macy, who represents Lyall Bay, New Zealand’s oldest surf lifesaving club, is the sole Wellington athlete in the 12-strong Junior Black Fins team who will compete in 43 pool and beach lifesaving events against over 40 countries over five days of competition in Adelaide. The Junior Black Fins will compete alongside the Black Fins team in the senior competition. “I only started surf lifesaving about this time last year,” she says. “I started training about a month before the pool champs last year and it just kind of went well! The fact she also lives near Lyall Bay, the club she joined last summer and represents, is more coincidental. In March Macy competed in her first New Zealand Surf Lifesaving Championships in Gisborne and won medals in the Women’s U19 Tube Rescue and Run-swim-run events. She recently had a taste of international surf lifesaving competition with the New Zealand Surf Lifesaving High Performance team that finished second at the annual Sanyo Cup in Japan. Macy has been swimming competitively at a national and regional level since she was young, representing Wellington plenty of times at national swim meets. Her grandfather used to coach swimming. She is the Wellington U15 Girls 100m backstroke record holder, setting her record time of 1.06.38 in year 9 in 2014. Right now Macy is busy training in the pool with both the Capital Swim Club squad and with others such as Lyall Bay Club Captain Sam Lee and Libby Bradley, who is in the 2018 New Zealand Surf Lifesaving Open Squad and who won six U19 titles at the Nationals in March. “That’s 10 sessions a week at the moment, if I go to all of them,” she says. This coming summer Macy is looking forward to her second full season with the Lyall Bay Surf Club and then is likely to be going to Victoria University next year. Macy Burns with Luther Maxwell of Wellington College at the Sanyo Cup in Japan June with the New Zealand Surf Lifesaving High-Performance team. PHOTO: Japan Surf Lifesaving Association. 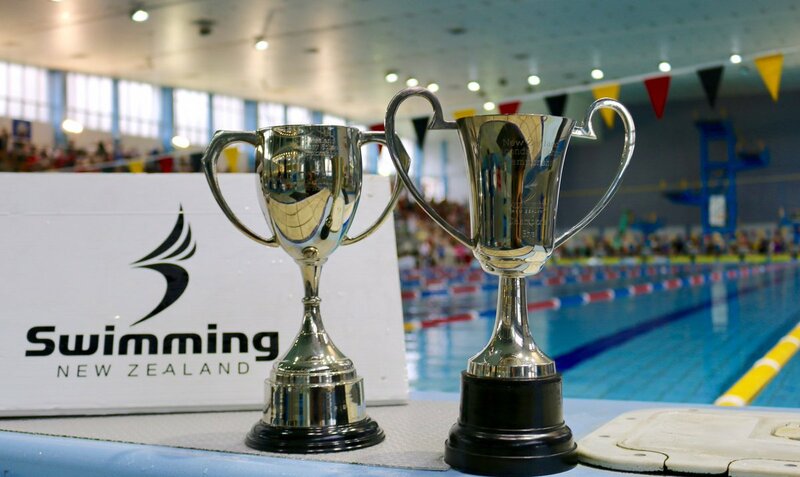 Hometown school Waikato Diocesan School for Girls and Tauranga Boys’ College won the respective girls and boys NZSS Swimming Championship titles in Hamilton over the weekend. Waikato Dio emerged as the overall winner from the three-day meet featuring almost 150 schools and some 580 competitors. They beat defending champions Auckland Diocesan in a two-horse race, with over 500 points separating the two Dio schools from third placed Pukekohe High School. 2015 champions Napier Girls’ High School finished fifth. Tauranga Boys’ College won the boys division with 860 points, almost 200 clear of St Andrew's College on 666, the top finishing South Island school in girls and boys. Two-time defending champions Westlake Boys’ High School finished third. The NZSS Swimming Championships is very much a team event, over chasing individual wins and times as is the case in traditional swim meets. Points were awarded in every race, with the school with the most points at the end declared the winner. Twenty six points were awarded for a first place in a race, 21 for a second, 17 for a third and so on a sliding scale. Waikato Dio’s win over Auckland Dio came down to the relays on the last day. Waikato had their noses in front for much of the meet, but Auckland took the lead on the last day. It came down to the final relay (16 and over Freestyle) and Waikato came out on top. Waikato Dio completed an outstanding year in the pool, having already won the Waikato and North Island Swimming Championships. For Waikato Dio, Year 10 Gina McCarthy was the standout swimmer from the weekend, winning nine gold medals, including wins in Freestyle (50m, 100m, 200m and 400m) Breaststroke (50m and 200m) Backstroke (100m and 200m) and IM (200m) races. Holly Isaac won a 10th gold for her school in the 100m Backstroke, while their also won six silvers and five individual bronzes and three relay golds. Tarquin Magner was the individual star for Tauranga Boys’ with their junior swimmers contributing to much of their points tally. Magner won six gold, one silver and two bronze meals in the 13-year-old age group. 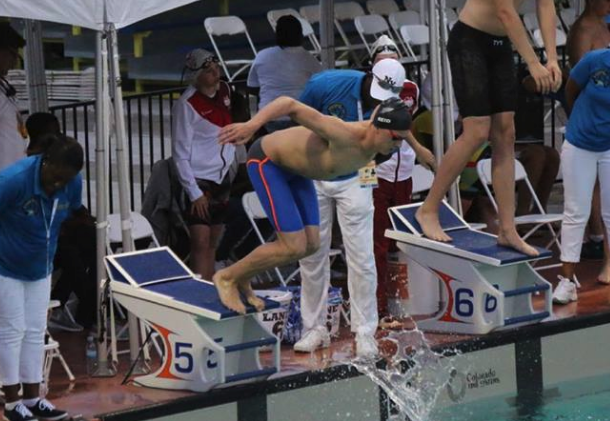 Tristan Eiselen won five gold and two bronze medals in the 14-year-old age group. Others who medalled in this age group were Daniel Shanahan (one gold, three silver and one bronze), Travis Hudson (one gold and two silver) and Matthew Wagstaff (silver). The four swimmers combined to win two gold medals in the 200m Freestyle relay and 200m medley relay, where they set an unofficial meet record 1:56.61. Another Bay of Plenty school was also celebrating, with the Mount Maunganui Intermediate swimming team at the top at the AIMS games for intermediate aged athletes. Liam Brown (captain), Declan Dempster, Daniel Shanahan, Matthew Wagstaff, Aidan Heath, Travis Hudson, Joseph Cook, Ben Paterson, Tarquin Magner, Tristan Eiselen, Louis Fitzjohn, Sam Jones, Jacob Browne. Chelsey Edwards at the Age Group Nationals in March. View more swimming photos at Dave Lintott Photography by clicking on the photo. ​Swimmer Chelsey Edwards returned from the Junior Commonwealth Games recently with a gold medal, but explains that accolade wasn’t the only highlight of her trip to the Bahamas. “The team environment was awesome. Everybody supported each other and you could easily tell the New Zealanders in the crowd. We are really noisy,” the Chilton Saint James School (Lower Hutt) swimmer laughs. Ironically Edwards, a member of the 4x200m freestyle mixed relay team, was a loner for much of the event. A serious virus consigned Chelsey to bed for several days. “We arrived five days before competition and had two practices a day and I felt good. As the competition got closer I started to get sick. I was really nasal and had to be isolated from my teammates. I was struggling with the temperature and felt pretty bad,” Chelsey complains. Chelsey was forced to revise her individual program as a result of the illness withdrawing from the 800m freestyle and failing to reach the final of the 200m and 400m freestyle. Edwards was assigned the task of swimming the last leg of the 4x200m freestyle mixed relay. A weak link in the Kiwi chain could have been costly. “I got better before the race, but I wasn’t 100%. I was so lucky we had a great team. We went from fastest to slowest and built a lead from the start. I was nervous on the last leg, but the lead was quite large. I was determined to swim well and actually went quicker than my individual race,” Chelsey reflects. Remarkably it’s not the first time she has battled sickness for triumph. In April at the New Zealand Age Group Championships the 16-year-old developed a debilitating chest infection which went on to impair her breathing in all six of her races. Despite the handicap Chelsey managed to win five medals, including gold in the 200m freestyle. “I am not sure why I get sick just before meets. It’s really annoying, but I guess the nine trainings a week teaches you discipline and toughness, “Chelsey responds when asked to explain her resistance. “I get a buzz out of achieving goals so you just battle through it, “she continued. Chelsey began swimming at the age of six and was so impressive in her early lessons she was fast tracked to an older class. Her first competitive breakthrough was at the age of 12 when she won seven medals at the New Zealand Age Group Championships. ​Last October, she won five gold and four silver medals at the national short course championships, as well placing second among all ages for the 200m freestyle. Gary Hollywood was the coach of the New Zealand team in the Bahamas. The vastly experienced campaigner described these Junior Commonwealth Games as a career highlight. ​​Lewis Clareburt caused a storm at the Junior Commonwealth Games recently. The Year 13 swimmer from Scots College, Wellington was the most successful athlete in the entire competition winning three gold and four silver medals. There were 1034 athletics representing 64 countries. The last thing Clareburt actually expected was a storm before a final, and what’s more it was prior to his signature event the 400m individual medley. Clareburt captures the drama. ​“They didn’t even have WiFi,” Clareburt laughs. Clareburt’s gold medal was soon splashed all over the internet. He secured a start to finish victory. “I led out from the butterfly which is a stroke I really like. I managed to hold the lead in the backstroke. Breaststroke is my weakest discipline, because I am still building the muscle required to go faster, but I was happy with my split. I brought it home in the freestyle,” Clareburt recalls. Clareburt’s victory time would have been good enough to finish 16th at the recent World Championships. Officially he is ranked 40th in the world. It should be noted international swimming powerhouse Australia sent a B team to the Games prioritising the World Junior Championships in Indiana later this month. However Clareburt’s time would have won him the Australian National title. Clareburt derived great satisfaction from his gold in the 4x400m mixed freestyle relay. New Zealand chose a fastest to slowest approach and Clareburt gained a lead in the first leg which the Kiwis managed to preserve. It wasn’t always plain sailing for Clareburt. He struck trouble in the 200m individual medley and finished with a silver medal. “I was in the lead, but during the backstroke leg the sun was so bright I couldn’t see where I was going. Towards the end of the lap I got my hands caught briefly in the lane ropes. Those few seconds cost me the gold,” Clareburt rues. Clareburt established five New Zealand records in the Bahamas. He broke the under-17 mark for the 400m individual medley and 200m freestyle. Additionally he passed the under-18 barriers in both the 200m and 400m individual medley and the 200m freestyle. Clareburt’s next goal is to perform strongly at the National Short Course Championships in October. Curiously in March, Clareburt was discarded from the New Zealand High Performance program where leading swimmers receive a card which entitles them to benefits such as free gym membership and access to expert coaching. Clareburt has chosen to stay in Wellington in 2018 rejecting half a dozen scholarships from the US. If his Commonwealth Games form continues he might have to swart aside even more offers from the States. Zac Reid – You gotta do it, You gotta love it. Zac Reid recalls of the pain endured during the 1500m freestyle final at the Junior Commonwealth Games recently. Reid developed a healthy lead, but deteriorating strength in the legs and a stubborn Aussie challenger made life difficult. “Despite the cramp I actually swam a similar time in the last half of the race, but the Aussie kept reducing the gap. Luckily my lead at the start was big enough to claim the win,” Reid admits. “You gotta do it, you gotta love it,” Reid, from Francis Douglas Memorial College in New Plymouth, responds when asked to explain why he sacrifices a typical teenage life to commit to swimming. All the lonely hours of training aren’t a burden. “I love working hard, having a focus and being fit and healthy. The lessons and disciplines of swimming can set you up for life,” Reid believes. Swimming runs in the family, Zac’s father Byron Reid represented New Zealand at the 1990 Commonwealth Games in Auckland. Zac’s breakthrough success was in 2014 when he won three age group gold medals at the New Zealand Short Course championships. In 2016 he qualified for the Junior Pan Pacific Championships in Hawaii. The Junior Commonwealth Games was Reid first major success outside of New Zealand and Australia and included a novelty triumph. Reid competed for New Zealand in the 4x200m mixed relay, his first relay ever. “That was crazy because it was real strategic. You had to get the order of swimmers in your team right to have a chance. We decided to start with two boys to get a break on the field and luckily the girls Chelsey Edwards and Laticia Transom did a great job to bring it home. It was pretty nervous watching boys chase girls,” Reid reflects. Reid swam the second leg for New Zealand after Lewis Clareburt led out. Reid’s next goal is to be New Zealand’s leading 1500m swimmer. His personal best in short course (25m pool) is 15.22.44 while his long course (50m pool) PB is 15.36.82. The next major meeting for Reid is the National Short Course Championships in Auckland in October followed by Commonwealth Games qualifying. Reid is grateful to have just secured sponsorship from the Engine swim team. Reid also competes in surf live saving out of the Fitzroy club. In 2016 he represented New Zealand at the World Championships after being named Under 16 Champion Male Athlete at the 2016 NZ Surf Life Saving Championships, having won both the U16 Run Swim Run and the Surf Race. In 2018, Reid plans to work in a water safety program run by his coach Sue Southgate and study extramurally at Massey University. 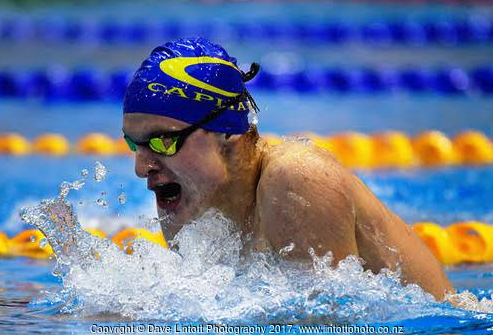 In March Capital swimmer Lewis Clareburt from Scots College in Wellington equalled 1996 Olympic Champion Danyon Loader’s near 25-year-old national age group record in the 200m freestyle, clocking in at 1.51.70. When the 17-year old returned home to check his Facebook page there was a special note in his inbox. “Danyon coached my older sister and passed on his congratulations, which was pretty cool. He also said, ‘this is only the beginning,” Clareburt reveals. In nine days Clareburt will head to the Bahamas as part of an 11-strong New Zealand squad for the Junior Commonwealth Games. Clareburt will be a busy boy competing in five individual events and three mixed relays where he will look to enhance his growing reputation which soared again at the New Zealand Open Championships in March where he won three silver medals and set the National age group record in the 400m individual medley (IM). Despite breaking Loader’s long-standing record, Clareburt prefers and is stronger in the medleys. Jack Cartwright the Australia 200m freestyle champion is four seconds quicker in the 200m freestyle. “The 400 IM is my favourite event. It’s fun testing all strokes and requires discipline and endurance to succeed,” he says. Times suggest Clareburt will be a strong medal contender in the medleys. His personal best in the 400 IM is 4:21.05 set in April. At the Australian age group Nationals, Nathan Robinson won the same event in a time of 4:21:80. Australia is typically the strongest swimming country at the event. Clareburt is swimming similar times to Australian Clyde Lewis who won the 200 and 400 IM double at the Games in 2015. Clareburt is taking nothing for granted. “Breaststroke is my weakest stroke. It’s a power stroke and I’m not the biggest so I am spending a lot of time in the gym bulking up and trying to get stronger,” he admits. The Bahamas is novel territory where diet must be monitored and heat presents considerable challenges. “Were not allowed to drink the local tap water and will be on a stricter diet than usual. Things should be pretty good, but we have to be cautious.” Clareburt explained. A new challenge will be taking part in the relays alongside teammates Chelsey Edwards, Madie Falconer, Callum Prime and Zac Reid. “We don’t have a lot of time together so when we meet we will work on transitions which is something we should be able to do quickly anyway. I’m not sure how we compare to the rest, but we will give it our best,” Clareburt predicts. With a strong showing at the Junior Commonwealth Games, Clareburt will likely appear at the sixth FINA World Junior Swimming Championships to be held in Indianapolis, Indiana in August. The championships are for girls aged 14-17 and boys age 15-18. Nearly 1,000 athletes from 100 different countries are expected to compete at this event. Christchurch Girls’ High School Year 12 swimmer Hannah Bates joins the 34-strong New Zealand team for the 2017 Commonwealth Youth Games (CYG) in the Bahamas from 18-23 July. Hannah has qualified for the 200m and 400m Individual Medley, the 100m and 200m Butterfly and the 200m Backstroke events. Anyone who has swum for fitness or recreationally will say that butterfly is one of the hardest strokes in swimming. How did Hannah get into butterfly? She qualified for the upcoming CYG team in April at the Australian Age Group Championships in Brisbane. She finished that trip as being 10th overall for all girls and boys on the ranking FINA points system. Hannah is very much flying the flag for the Mainland in her age group in swimming. That is Nick Moulai from St Bede’s College who is in the athletics team competing in the 1,500m and the 3,000m. Hannah and the New Zealand CYG team depart for the Bahamas during the upcoming school holidays.